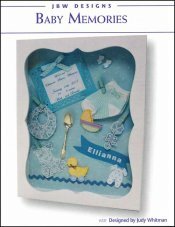 Baby Memories [C6967] - $8.00 : Yarn Tree, Your wholesale source for cross stitch supplies. Cross stitch pattern by JBW Designs. This set of three includes designs for booties, a bib, and rattle. Stitch counts: Bootie 34 w x 38 h, bib 39 w x 42 h, and rattle 19 w x 36 h. .